I’m the creator and owner of JARFLY: a space for handmade cards, vintage rentals, writing and a wee bit of nonsense. I love art, antiques, wedding design and anything layered in whimsy. I hope you’ll all be able to stop by my little blog for a visit! Today’s project is not only a favorite of mine, but a serious favorite of the many brides who rent from me out here in Portland, Oregon. Tea tins can make great centerpieces & storage containers. However, actually shopping around to find some “cute” enough for this can be a large task. The good news is you can give them a make over that is simple and easy. Getting excited over old tins = weird. Yep…and proud of it! 1. To start you’ll need PAPER modge podge, paintbrushes, acrylic paint and of course, some old tea tins (or tins of any kind). It’s a good idea to wipe off your tins before painting them. 2.DO NOT break down and buy tins from Michaels, Amazon.com or Ebay. Just take a little time to hunt at places like Value Village, Salvation Army, Volunteers of America, and of course… garage sales. I’ve found them for as little as $0.10 at these different locations. I wouldn’t recommend paying more than $0.99, and that should be for a darn good tin. 3. Apply a nice first layer of paint. Choose a rich color that you would use in many different rooms. Let the first coat dry, and then apply a second coat. Let the tin dry completely before doing anything else. 4. The next step is the most fun, picking your design for the front of the tin. I chose to collect some antique fruit labels from The Ink Painter on Etsy. The store’s prices are very reasonable. However you can design your own by hand or in photoshop…also clippings from wrapping paper and magazines can work well too. 5. Apply a thin layer of PAPER modge podge to the back of your label. Carefully, place it on the desired area of your tin. Make sure to smooth out the edges and watch for any “bubbling” in the paper. 7. Lastly, after your project has dried completely…all you have left to do is decide how to use it. I think the tins make great vases. In fact, I will soon be renting them for a very good price for weddings. So if you don’t feel like making your own, contact me! Hope you enjoyed re-purposing your old tins. Check back at Jarfly next week for more “do it yourself” ideas and insane romps down craft alley. Later folks! I love these tins… I want them all! With the Holidays coming and so many free printables out there this would be a GREAT ides for gifts or decorations. it is a PLEASURE to have you! Please take a minute to visit and thank Jenni for her great tip and idea! PreviousDIY: Add a Pin It Button to your post! NextSo much to be happy about! Wonderful and what a fantastic picture of you-something I'm trying to achieve right now. So cute and "vintagy" looking. Could really do some fun ones for Christmas! I'm hosting my 1st Link party and would love it if you would link up one of your awesome projects! Love getting your blog in my email box. great way to recycle those tins. 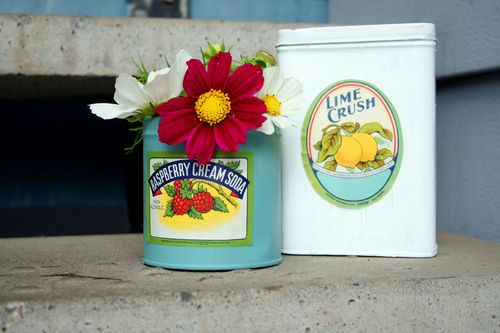 Who knew that you could transform those yard sales tins into beautiful home decor objects. Amazing! Thanks for introducing us to Jenni; another super creative blogger.